We all know waffles, right? A light, slightly eggy cake cooked in a waffle iron so that it’s crispy on the outside and tender on the inside. We enjoy it with a pat of butter and real maple syrup. Some people eat waffles with fried chicken as a savory Southern twist. The Southeast Asians put their own twist on the waffle by adding a bit of pandan extract to the batter. Pandan, or screwpine, is a tropical plant that has fans of long, green leaves that, when cooked, imparts a sweet, pleasingly fragrant aroma to whatever it is cooked with. We used whole pandan leaves to infuse our nasi lemak coconut rice dish. 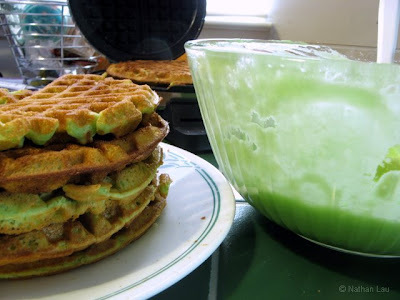 Here’s a pandan waffle recipe that makes a delicious breakfast, snack or dessert so good, you won’t want to stop eating them. It is a tried and true recipe, something we make quite often. The recipe comes from food blogger Andrea Nguyen of Viet World Kitchen, who is the author of “Into the Vietnamese Kitchen“. What is the difference between a spring roll and a summer roll? A spring roll is a roll filled with meat and vegetables, wrapped in a skin usually made from wheat flour, and fried crispy. You commonly find it served with a thick, sweet-sour sauce. 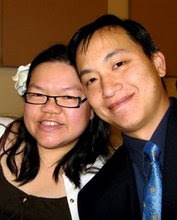 King Eggroll in San Jose has built a thriving business on the quality of its spring rolls. A summer roll is a roll filled with meat and vegetables, wrapped in a skin made from rice paper, and uncooked. 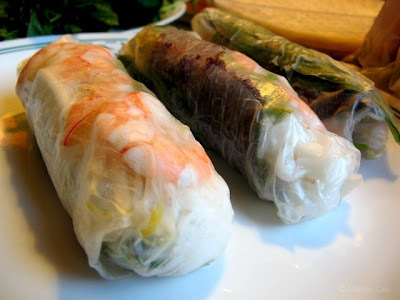 (The Vietnamese name, gỏi cuốn literally means “salad roll”.) It is served with a hoisin-peanut dipping sauce. Most Vietnamese take out places, like Huong Lan on Tully Rd., sell various kinds of summer rolls. Of course, if you have the ingredients, you an assemble them at home yourself. Here, we used shiso, mint, and Thai basil leaves plus rice vermicelli noodles and bean sprouts. Cooked shrimp was the protein of choice for this one. There are lots of choices for different ingredients – use your imagination! The real trick is in the wrapping. The rice paper sheets are very delicate once they get wet. You quickly dip the skin into a bowl of warm water then immediately move it to the assembling plate. Layer the ingredients, then gently wrap and roll. To make the dipping sauce, I mixed some hoisin sauce, some chunky peanut butter, a little sesame oil, some water to thin it and some sriracha chili sauce for spiciness. Annie is much better than me at wrapping summer rolls. Once, in order to save time, I piled a bunch of dry rice paper skins on a plate and poured water over the whole bunch to soften them. Of course, I got a soggy mess, especially with the bottom skins that sat the longest in the water. Good thing these skins are relatively inexpensive! Now, I just leave the wrapping to her. Our Vietnamese neighbor’s son was having a birthday party, and we were invited to come over and join in the celebration. Even after stuffing ourselves with all the amazing salads, rolls, noodles, and fried chicken, we couldn’t say no to dessert – a lovely bowl of hearts, eyes, and frog eggs. No, there aren’t really animal parts in this dessert. 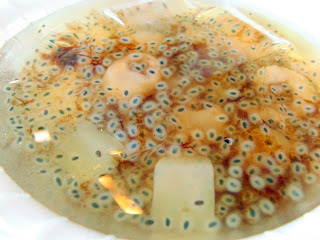 It’s actually made up of hearts of palm, dragon eyes (longan fruit), and what Annie calls “frog eggs” or biji selasih, (otherwise known as the seed of Holy Basil), swimming in a cold, sweet syrup. It was so good, I had seconds, and thirds, and took home a container full to enjoy the day after. I wish I knew where they got the Holy Basil seeds. I’ve only seen them sold in the Asian grocery as a drink. I wonder if the Indian store has them. Our neighbor made a great tasting soup for us that we had to get the recipe for. Saute some sliced onion in a stock pot. Add minced pork and brown. Cover with water, add chopped tomatoes and bring to a simmer. Add in sliced eggplant and stir. Season with a bit of fish sauce. Chop up some shiso (perilla) leaves and add them to the soup. Serve hot. So good, one bowl is not enough. SWIFT Theme by Satish Gandham. 50 queries in 1.068 seconds.